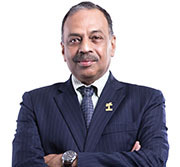 Datuk Dr. Kalyana Sundram is currently Chief Executive Officer, Malaysian Palm Oil Council (MPOC). Following his postgraduate studies from University of London, and research stints in USA, Australia, Netherlands and at MPOB, he has clocked 37 years in palm oil research and industry. These include various aspects of oils and fats process technologies, nutrition, biomedical applications and technical marketing. He is a fellow of the Malaysian Academy of Sciences, Fellow of the Nutrition Society and member of several international professional associations. Datuk Dr. Sundram is primarily acknowledged for his work on palm oil and has served on international expert consultations and committees at FAO/WHO, IUNS and MPOB. He publishes extensively and holds 21 patents. He has coordinated more than 170 research and promotion projects on palm oil including health, sustainability and wildlife conservation. Currently he heads MPOC with focus on palm oil promotion and marketing, addressing the anti-palm oil campaigns and uses science based outputs to communicate on palm oil.